Feature Article: Should I Be Concerned about Hepatitis A? The hepatitis A vaccine is usually considered a travel vaccine. Yet thus far in 2017, more than 1,000 people have been sickened and 15 have died from infections with hepatitis A. 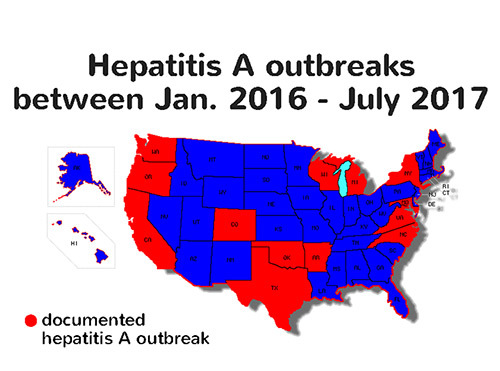 In fact, since 2016, hepatitis A outbreaks have been reported in at least 13 states: Arkansas, California, Colorado, Maryland, Michigan, New York, North Carolina, Oklahoma, Oregon, Texas, Virginia, West Virginia and Wisconsin. So, how does this happen, and who is at risk? Particularly troublesome is the fact that infected individuals can transmit the virus up to two weeks before symptoms begin, which means they often transmit the virus before they even know they are infected. Because sanitation may be less stringent while traveling in other countries, hepatitis A is commonly thought of as a concern only when traveling. However, the reality is that if you go out to eat at a restaurant or purchase uncooked foods that may be contaminated, the possibility of exposure to hepatitis A exists in every country. Since its inception, the hepatitis A vaccine has been very effective at preventing infections and decreasing the annual burden of disease. For example, prior to vaccine licensure in 1995, about 35,000 people in the U.S. were sickened each year by hepatitis A. Less than 20 years later, in 2014, only about 2,500 people were sickened. For children, the vaccine has been part of the recommended infant immunization schedule since 2006. It is given in two doses beginning at 12 months of age with the second dose at least six months after the first. Because most adults 23 years of age or older probably did not receive the vaccine as children, it is worth checking if they could benefit from vaccination. Adults receive two doses, with the second dose following the first by at least six months. Hepatitis A outbreaks are often linked to a contaminated food item. For example, contaminated strawberries sold to consumers caused two recent domestic hepatitis A outbreaks. Therefore, if you live in an area with a current outbreak, it is wise to avoid at-risk foods not prepared by you directly until the source has been identified and transmission halted. While at home, always make sure to thoroughly wash all uncooked or unpeeled vegetables, fruits and lettuce. Travelers to countries where hepatitis A virus infections are common should avoid uncooked foods, in addition to ice and non-bottled water, uncooked shellfish, and food from street vendors. Although you may not hear about them, serious and sometimes widespread hepatitis A outbreaks occur every year in the U.S. In fact, between 50 and 100 Americans die each year from hepatitis A infections. Therefore, it is important to realize the hepatitis A vaccine is for more than just travelers. Also, since the hepatitis A vaccine does not cause any severe reactions, the benefits of vaccinating yourself and your family outweigh any risks.